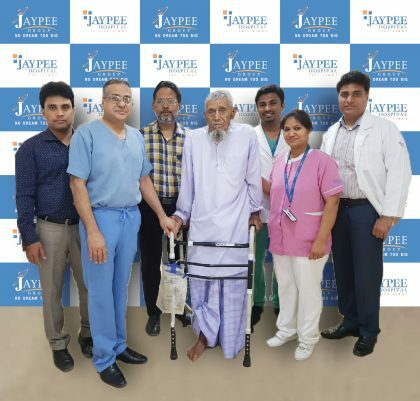 A team of orthopaedic and joint replacement surgeons led by Dr. Sanjay Gupta, Associate Director, Orthopedics Department, Jaypee Hospital, Noida, successfully performed a complicated right-hip replacement surgery on a 103- year- old man. The high-risk surgery was performed on Mohd. Bandhu Baksh, a native of Jharkhand, who fractured his hip bone approximately 3 months ago prior to the surgery, while working at home. The surgery was executed using the minimally invasive method, minimizing the bleeding risk and other wound-related complications during surgery. A high degree of precision, coordinated teamwork and dexterity skills were executed by the team of operating surgeons to complete this complex surgery within the time frame with a successful outcome. Due to the delayed treatment, complications such as dehydration, urine infection, chest infection and a massive bed sore also developed. Further, in two months after fracture, the bones had resorbed and soft tissues were all scared and stuck to a bone. “We had to be very meticulous in handling soft tissues while maintaining homeostasis and ensuring the duration of anaesthesia/surgery is not prolonged to avoid chances of complications,” added Dr. Gupta. A team, including Orthopaedic surgeons, Radiologist, General Physician, Anaesthetist, Physiotherapist and allied para-medical staff, was formed to best optimize the patient’s fitness for surgery. “After the successful surgery, he was kept in ICU for a couple of days and then moved to the ward where the nursing and the physiotherapy team were able to help him walk again within a few days,” Dr. Khan added. Considering itself a responsible healthcare paragon, Jaypee Hospital offers the finest range of healthcare services to meet all the current needs of patients. Combined with an experienced team of specialized medical professionals, Jaypee Hospital is committed to providing world- class treatment at affordable price.